Barbara M: "Dr. Johnson is the best around. He cares about his patients and takes care of them. He has helped me sooo much! I just love him!" Antonia B: "Both Dr. Concha and Dr. Johnson are wonderful "care" doctors. Dr. Concha is exceptional! He has taken my husband from a very BAD situation to the best of health and he continues to treat and care for him and myself. This is an exceptional practice and we are blessed to have both Dr. Concha and Dr. Johnson as medical doctors." Gary K: "Dr. Johnson is a terrific doctor. The staff here are very nice and know exactly what they"re doing. I highly recommend Coastal to anyone that needs foot care." John and Elizabeth C: "Caring, gentle treatment. Pleasant responses. Great personality. We would trust these doctors with any foot or ankle problems." James P.: "Dr. Concha is a good doctor. Very personable, gentle and informative. I would recommend him to others very highly!" Nancy L.: "Dr. Johnson and the whole staff are the best! They are helpful and very kind. Since I have been coming my feet feel much better!" Lorne L.: "Dr. Johnson and staff are very pleasant. He relieves the pain of my foot painlessly and it feels so good after treatment. I would-- and have-- recommended Coastal to my family and friends." Richard W.: "Reasons I keep coming back: The staff and Dr. Concha have treated me as a human being. In this day and age there seems to be very little of that. They are very courteous and are gentle and concerned about your problems. They always have a smile for you when you arrive." 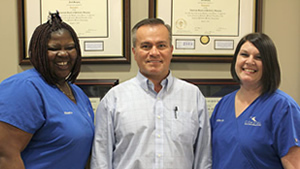 Richard F.: "Dr. Johnson provided painless procedures on my toes to alleviate the pain. He is very friendly and easy to talk to. He is agreeable to schedule with. It is a pleasure to visit this office. The service is very professional." Caroline D.: "It is a pleasure to visit Dr. Concha and all of the staff." Robert L.: "I have been to at least four other medical practices for related or similar problems. The patient care I received with Dr. Johnson far exceeds the others. Dr. Johnson expresses a sincere concern for me and my wellness to ensure progress. The staff and doctors always display professionalism and a keen knowledge of patient's needs and requirements." Thomas Y.: "I was suffering from extreme pain from ingrown toenails for many years. They were extremely painful. In one office visit, Dr. Concha surgically corrected the condition and I am now pain-free after five years! Also, through use of Dr. Concha's patented Funga Soap, I no longer have athlete's foot-- a condition from which I suffered from since high school athletics in the 1950's! Dr. Concha is a knowledgeable, thorough professional. 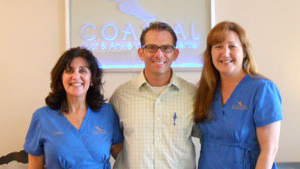 I am completely satisfied with the Coastal Foot & Ankle Wellness Center facility and staff." Mary H.: "I know that Dr. Concha is a very caring doctor. He makes procedures painless and explains what he is doing. I don"t live in St. Augustine, but I continue to return every 90 days for my foot care just to see Dr. Concha." Robert C.: "Dr. Johnson is a doctor who cares, not just provides medical treatment. The medical treatment is professional with great results in excess of what you would expect." Ed S.: "The office staff is very competent and friendly. It is a pleasure to come here. I would love to have this staff working with me at my firm!" Raymond H.: "I have been going to Dr. Johnson for many years. I have diabetes and he treated and cared for my feet with utmost concern and excellent care. He is a most friendly and caring person and treats his patients like family. The office staff is excellent and very accommodating." Ronald H.: "Patient care, bedside manner and general concern for the patient is of the utmost concern for the doctors and staff at Coastal. 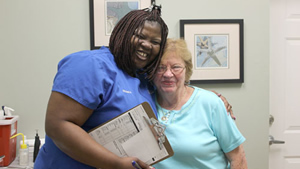 It has been pleasurable under some rare conditions to have been a patient of Dr. Concha at Coastal." Joyce G.: "I have been a patient of Dr. Johnson for 7 years. I see Dr. Johnson for diabetes and neuropathy in my feet. He has given me new medications that really help. The girls in the office are very helpful, caring and smile a lot. They have helped me with paperwork to resolve problems with my insurance. I hope to be a patient of Dr. Johnson for a long time. Thank you all for being there for me!" Diane D.: "I consulted Dr. Johnson for treatment of a problem on my right foot. I needed surgery. Dr. Johnson carefully explained the procedure and possible complications. He was professional, caring and very capable. My follow-up care was uneventful and I am pleased with the outcome. Dr. Johnson and his staff are truly caring, concerned people. It is a pleasure being in their care. I would recommend this practice to anyone needing foot care." Margaret S.: "I have been a patient of Dr. Concha for 15 years. I am very pleased with the help I receive. The staff is really wonderful, friendly and constantly helpful. Not much time to wait from your appointment time to the time you get to the exam room. On a scale of 1-10, this office is easily a 10!" 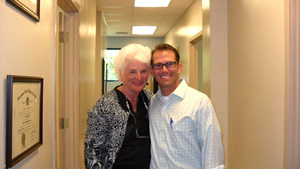 Michael O.: "Dr. Johnson has taken special care of my foot problems and I am very pleased with his care." Barbara B.: "Dr. Concha has taken excellent care of my feet. His recommendations have always been helpful in alleviating pain and discomfort. The surgery he did on my toe was practically pain-free. He is a very capable and caring physician who is very responsive to his patients. I would recommend him highly. Also, his staff are delightful!" Mary S.: "I had been suffering from plantar fasciitis for over a year and had some treatment in Massachusetts. The cortisone shot Dr. Concha gave me completely resolved the problem. I found the practice extremely friendly and competent. Dr. Concha was friendly, listened well and had good suggestions for foot health. I purchased three pair of worthwhile shoes and I just love them!!! I have recommended this practice to all of my friends!" Lenora M.: "Nice staff. So caring and knowledgeable. Dr. Concha is the best doctor ever!" Bob D.: "Great doctor. Great people. Great help. Great office. Great" EVERYTHING!" Monica T.: "Doctors Johnson and Concha are wonderful!! They are very knowledgeable and caring. The staff is very prompt and caring. I would recommend them to anyone!" Leanne L.: "I would just like to say that I have struggled with immense foot problems since my diabetes diagnosis in 2005. I have had many issues with my right foot that resulted in an amputation of my right great toe and have had several other surgeries on that foot. I truly was at the lowest point, feeling as though I would just eventually lose my foot and then my leg. But Dr. Concha was called to consult on my most recent foot infection involving the second toe. He has given me renewed hope. He is so kind and caring and really has an understanding of what I"m facing and made me feel like we are in this together on a mission to prevent me from losing anymore toes. He explained things to me in a way I could understand and just shows compassion and care. I look forward to continuing to be a patient of Dr. Concha."